Ekornes’ Stressless Wing Office (M) chair takes a vintage look and updates it with state of the art ergonomic design. With an endorsement from the American Chiropractic Association, this masterpiece will provide optimal support to your neck and back. The Plus™ and Glide systems work beneath the surface to provide a level of comfort you never expected in the office chair. A 360 swivel and wheels add ease of movement with unprecedented comfort. With its classic look and meticulous engineering, this polished chair is essential to any home or business office. 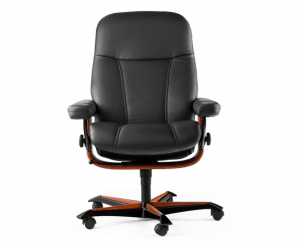 Wing Office (M) chair supports your work by offering correct support to your neck and back. The Plus™ system responds to shifts in weight so your lower back always has the support it needs. By properly balancing your weight in every angle, the Glide system allows you to release all tension in your body. Comfort Zone technology makes the cushion conform to your body allowing you to experience a perfect balance of cushion and support. Finally, it has the two basic necessities of an office chair – a 360° swivel and wheels. Give your neck and back the support they need so you can work to your highest potential. Take care of your long-term health and productivity by giving your body a chair designed to meet its needs. The Magic Office (M) chair will care for your body and add style to your office.